My favorite pies have a crumb topping. I always choose a crumble over a crisp, and have even streusel-topped pancakes in the past. And with all these summer berries keepin’ it real at the farmer’s market, it only makes sense to give ice cream the crumble remix. And my mom has major pie skills. She also loves a crumble topping like no other. So you better believe I called my mom when I was tasting this right out of the ice cream maker. “It tastes just like pie!” It’s an ice cream pie miracle. A real lovechild between pie and ice cream. Make roasted berries. Preheat your oven to 375F. 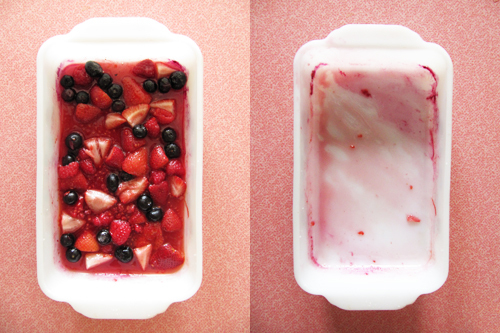 Combine berries with sugar in an 8-inch glass or ceramic baking dish. Gently mix. Roast for 8 minutes. Let cool slightly before pureeing with lemon juice in a food processor. Strain puree into a small bowl through a fine mesh strainer. Chill. Make crumble. Turn your oven down to 350F. Line with parchment paper. Whisk together the flour, the remaining 1 cup of sugar, salt and remaining 1/2 teaspoon of cinnamon into a medium bowl. Cut butter into flour mixture with pastry blender until mixture resembles coarse meal. Transfer to the prepared baking sheet and bake for 30-35 minutes, tossing every 10 minutes, or until golden. Cool completely. Make ice cream. Mix about 2 tablespoons of the milk with the cornstarch in a small bowl to make a smooth slurry. In a medium bowl stir together the cream cheese and salt until smooth. Combine the remaining milk, cream, sugar, corn syrup, vanilla seeds, and bean in a 4-quart saucepan. bring to a rolling boil over medium-high heat, and boil for 4 minutes. Remove from heat and gradually whisk in the cornstarch slurry. Bring the mixture back to a boil over medium-high heat and cook, stirring with a heatproof spatula until slightly thickened, about 1 minute. Remove from heat. Gradually whisk the hot milk mixture into the cream cheese mixture until smooth. Whisk in a 1/2 cup of the chilled roasted berry puree. Cover bowl with plastic wrap and chill ice cream base for a few hours or over night. When ready to churn, strain mixture (removing vanilla bean) through a fine mesh strainer. Freeze in your ice cream maker according to the manufacturer’s instructions. 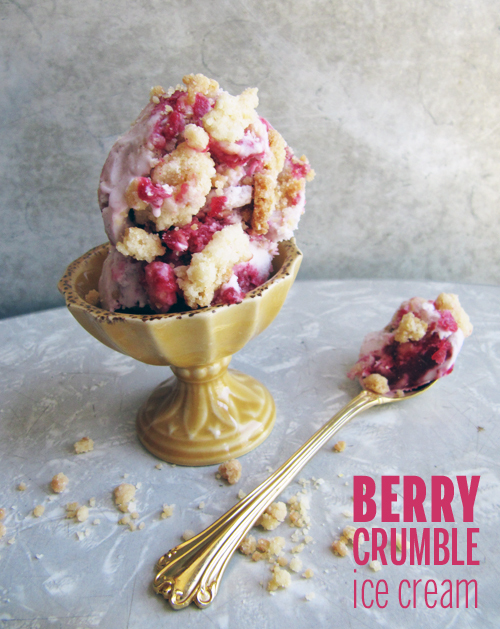 Once fully churned layer in a one-quart container with the leftover berry puree and crumbles. Top ice cream wit plastic wrap and an airtight lid. Freeze for at least 4 hours. You’ll have extra crumbles for serving. Roasted berry ombre art! The best art of all the art! oh wow. 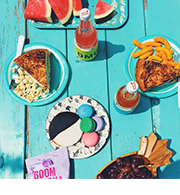 this looks so good…perfect for summer. I’m definitely going to give this a try. I don’t have an ice cream maker but I’ll try the home method and see if it works. Thanks, Sophie! Let me know how it goes! Gurl.. this is like pie and ice cream mixed all together in a bowl of happiness. OMG. This looks absolutely delicious! thanks for figuring out how to have pie without actually making pie! champ! Berry crumble ice cream?? I WANT. This looks like a golden chalice of delicious! This comment made me smile like whoa! OMG, this looks amazing!!! I think I just died and went to heaven! God, I need that ice cream maker I’ve been after for 2 years! Yes, Annie! You totally need an ice cream maker. It’s life-changing, ya know? I WANT this…now..but first I have to buy cream and whole milk!! THEN it is on!! Yay! I hope you love it, Mum. I just know you will! I so want some of this ice cream! 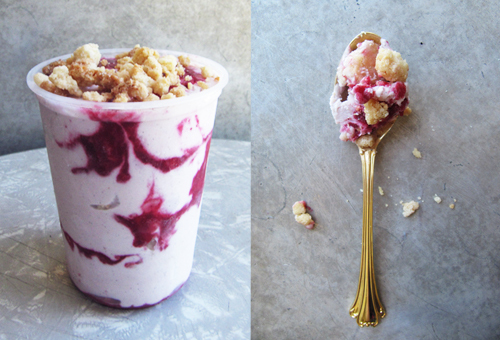 As if ice cream alone wasn’t good enough you added berries and crumble. Amazing! I am totally a crumble or crisp girl – I mean, I’ll eat a cobbler if it’s the only option – but I’m a HUGE fan of steusal topped anything. This ice cream looks/sounds absolutely delicious! Dang girl, this looks bomb. I want crumble in my ice cream! This is happening this week! I’ve been in a crumble kick lately do this is right up my alley! Yay! Let me know what you think! Oh shucks! <3! I'm so glad you found me. My dad is a master pie maker in my family. And this ice cream is insane looking. 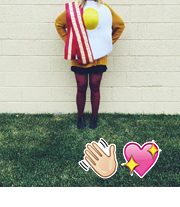 Ooh you should totally make this for your pie-making dad! 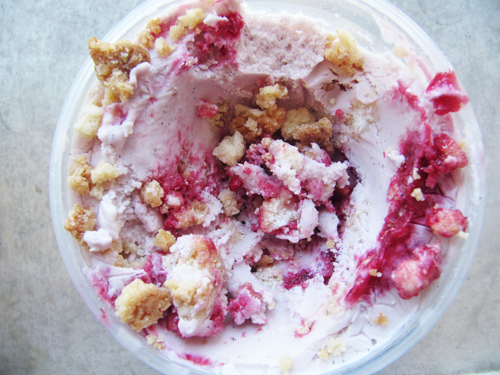 I’d eat crumble on anything, but I love this idea of it in a pie-like ice cream! Genius! Thanks, Nicole! Can’t wait to hang on Saturday! OH.MY.GOSH… This ice cream is amazing! Finally, an ice cream base that I love. I’ve tried so many recipes, including the custard kinds, but I’ve never been a fan. Weeeeeeelllllll, this is it!!! I can’t wait to have this for dessert tonight! The crumble is GENIUS! So thankful I found your Blog! Great idea. I too always choose the crumble topped desserts and pie. This is brilliant! Thanks, Katie?! Just have to crumble it up, right? Made this for my poppa on fathers day! He LOVED it! (along with the rest of my family!) I used only raspberries as he is a big raspberry fan and it came out tasting just like raspberry cheesecake with that little bit of cream cheese in the base. SO delicious. thank you! I think you just twisted my arm enough to get that ice cream maker for my Kitchenaid stand mixer! Keep up the good work. I don’t see cinnamon in your ingredient list, but in Step 2 (crumble) it says to mix in the “remaining 1/2 tsp. of cinnamon”. Can you clarify? Is there cinnamon to be added to the berries as well? I made this today and it was delicious! Although next time I will add less of the crumble mixture. The ratio was just a little off for my taste, but everything was very tasty!